Eleni Lytra-Charara was born in Athens and grew up in Konistres in Evia. She had been working for twenty years in National Bank of Greece, studing at the same time in Athens University of Economics and Business. She studied also in the National and Kapodistrian University of Athens and attended creative writing seminars. She is a member of UNESCO TLEE, of poets in the Educational Group of Petroupolis and Community Center of Kymi-Aliveri in Evia. She is a coordinator of a Reading Club in Konistres, and X.E. DARDANOS Publications. She lives in Kifissia and the spends her free time with writing. She is married, and has a daughter and a son. Roula Pollard: Dear Eleni, you are primarily a novelist. How did the memories and experiences from your childhood and the environment you grew up affected your writing? Eleni Lytra-Charara: Our childhood years define who we are. Our family, our social interactions and our place of birth mould our character and form our way of thinking. I grew up, until my adolescence years, in a village of Evia. I have been blessed to be surrounded by an affectionate family and caring friends blessed by freedom in natural surroundings. I have been fortunate enough, to have great teachers who taught me to read literature and dream. We faced many financial difficulties, due to rough times, but "books" were always a part of our lives. I believe that writing is an integral part of my memory from all these influences. Roula Pollard: Which International and Greek writers influence your writing and impressed you before you became a writer? Eleni Lytra- Charara: I cannot distinguish which book or writer influenced me the most. Famous Greek writers, such as Papadiamantis and Kazantzakis, as well as Dostoyevsky and Leo Tolstoy played a great role, of course, modern Greek and international authors and poets have also affected me as they influenced my ideas and inner growth. Roula Pollard: You had five novels published so far and also you are a poet. Is there a common theme running through your writing? Eleni Lytra- Charara: The main idea, in my books, the reader discerns is “Nostos”, which in Greek means nostalgia for the homeland. The eager desire of a Greek immigrant in a broader sense, as well as the haunting thought of returning to the homeland always exists in my characters and poems. Roula Pollard: Tell me more about “the theme Nostos”. What are your particular experiences related to this theme? Eleni Lytra- Charara: “Nostos” is someone’s desire to live with his loved ones in his homeland. Personally, I experienced this feeling through my friends and relatives, during my journey to Australia. I felt intensely this overwhelming feeling, this repatriation yearning. Even those who were born from Greek parents, second or third generation immigrants, have a strong desire to return to their parents’ homeland. A very close friend of mine, who lived there, opened her heart to me, when we met. I felt her intense feeling of nostalgia and that was the inspiration for my first novel. Also, my strong childhood memories reinforced this experience. As you know, travelling in those days was not easy, not even to receive news from relatives who lived abroad. I was feeling my mother's pain for her sister, who lived in Australia, and never saw her during her lifetime again. In her letters, feelings of nostalgia were underlined as well as her homesickness. Roula Pollard: Can you mention any Greek poets and writers, since antiquity, who are known internationally for this particular “Nostos” theme? Eleni Lytra- Charara: The idea of “Nostos” in Homer was a great topic. It was linked with the Trojan War, it was a postwar chapter in “Odyssey”, focused on Odysseus and other prominent epic characters. 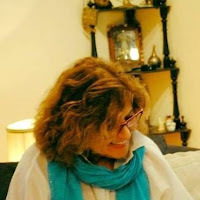 Roula Pollard: My mind also goes to the Greek poet from Alexandria, Egypt, Konstantinos Kavafis and to his poem “Ithaka”. Is there any relation between “the Homeric Nostos”, your “Nostos” and Kavafis’ poem “Ithaka”? Eleni Lytra-Charara: Kavafis is inspired by Homer's “Ithaca”, Odysseus's desired destination. Kavafis refers to his own Ithaca, a psychological and metaphysical quest for life experiences and wisdom, through an inner journey. The poet uses symbolic Homeric names (Laestrygones, Cyclops, Poseidon) without any reference to Odysseus, and these symbolize human aspirations such as "saints, amber, evanescent and hedonistic herbs". My theme of "Nostos" is about the “contemporary immigrant” who has left home to seek a better life. But respects the new country he settles in. However, he always thinks about returning home. So, my “Nostos” touches a little bit Homer's as well as Kavafian Ithaca. Roula Pollard: Do you find any relation between the current waves of educated Greek immigrants abroad and the waves of “war refugees” from Asian and African countries to Europe? Eleni Lytra-Charara: Through all the migratory flows, there is a need for a better life. This is the common element in all these immigration flows. Depending on their abilities and the conditions, immigrants resort to countries that are “more friendly” and “easy” to adjust. Roula Pollard: Returning to your writing, can you please refer to your personal writing style. I understand it is deeply personal and charismatic. Eleni Lytra- Charara: Each writer adopts his/her own way of expression and own personal style. My writing style, according to my readers, is simple and documentary with some theatrical elements. Perhaps this is true, because when I write, it feels like talking to my heroes, and we enter into dialogues. Roula Pollard: What is your opinion about contemporary novel writing in Greece and which Greek novelists from the 20th century up to now, express clearly, in your view, the Greek way of life and society. Eleni Lytra-Charara: During the last decade, the number of novels published in Greece has been increased. Young talented writers are published daily. In my opinion, there are plenty of remarkable writers who are widely known abroad. Some of the most well-known and well-read contemporary writers are Nikos. Kazantzakis, Vassilis. Vassilikos, Pavlos. Matesis, Thanassis Valtinos, Rea Galanakis and others. Roula Pollard: What is your involvement in the contemporary literary scene in Athens? Eleni Lytra-Charara: Recently, I have been an active member of “Petroupolis poetry group” led by the well-known author Dimitris Varvarigos. I am also member in a group, which organizes poetry events. Our aim is to promote communication through poetic poetry. I am also a coordinator in two Reading Clubs, one in Athens and one in Evia Island, where we read novels and share views and ideas. So, we enhance creative reading and friendship. Roula Pollard: Thank you Eleni, for this inspiring interview. I wish you more success to the forthcoming publication of your book. Eleni Lytra-Charara: Thank you so much Roula, for our fruitful communication and your wishes.